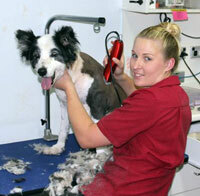 We have our own separate department for grooming of dogs and cats. The staff who work in this department are trained to clip and groom dogs and cats of different breeds and to different owner expectations. The grooming department is open Monday to Friday from 8.00 am to 5.00pm. We do recommend all animals with long or thick coats are clipped during our warm and hot months from September to April and some of these animals also need to be clipped during our mild winter months. All animals who are booked in for a clip are also hydrobathed while they are in our care. Some cats do need to be chemically restrained (tranquillised or given an general anaesthetic) so that they can be groomed and we do have the facilities and the staff to administer this restraint if necessary. What age should I start clipping my dog? We recommend clipping puppies for two reasons – to keep the puppy cool and to prevent the puppy developing problems from foreign bodies such as grass seeds. The first 3 to 4 months the pup is born with a different coat than the adult. The puppy coat does “breathe” a lot better than the adult coat as it has not developed the heavy undercoat. That is why puppies need to huddle together to keep warm. Once the adult coat develops then the puppy should be clipped. If the puppy develops it adult coat in late spring, summer or early autumn then we recommend the pup is clipped between 4 to 6 months of age. If the area that you live has burrs or lots of grass seeds that may endanger the pup then we would start clipping around 3 months of age. What is a summer clip? A summer clip is aimed at keeping the puppy cool during the warm and humid months of our area. A summer clip is quiet short and is called a “number 7”. There are two ways to clip a number 7 – we con go with the grain of the hair and that means that the coat lies down before the blade of the clippers as it is taken over the dog. This leaves the coat around about 4mm in length. The other way is go against the grain of the hair. This means that the hair stands up as the blade is taken over the dog. This leaves the coat around 2mm in length. Our recommendation is to go against the grain – the short coat still protects the animal against solar radiation (sun burn) and allows the animal to stay cooler longer. What is a winter clip? A winter clip is longer than a summer clip because the cooler weather means that the animal does not overheat as much. A winter clip is a “number 5” and usually a winter clip goes with the grain of the hair. This leaves the hair around 6mm in length. Is it a good thing to clip my dog in winter even though it is so cold? If the temperature of the area is below freezing (0 degrees) then we do not recommend dogs get clipped. Remember, in our area the night time temperature may get below 10 degrees (and remember that dogs and cats have developed coats to survive in minus 10 degrees) but the daytime temperature often gets over 20 degrees. In the middle of the day we can take off our jumpers and coats but the animal can not. A lot of dogs and cats suffer in our winter because owners do not recognize that the animal is overheating in the middle of the day. We recommend to clip their coat (a bit longer in winter – use a number 5). At night put a coat on the dog and during the day take the coat off the dog. How often should I get my dog or cat clipped? It depends on the type of coat and how fast it grows back. As a general rule we recommend all long and thick coated dogs and cats are clipped in September, late November, late January and again in April. Some animals need to be clipped every 6 weeks – especially toy and miniature poodles. Why not use a tranquilliser rather than an anaesthetic? Tranquillisers are just as dangerous as an anaesthetic to the animal. A cat can still get psychologically stressed under the tranquilliser and this can have a major problem to the cat over the next few weeks. Remember that a tranquilliser does not mean that the cat does not understand that something is happening that it may not like. If we use a tranquilliser – it still takes two people to handle and groom the animal. If we use an anaesthetic the cat is not stressed and wakes up calmly and not full of anxiety. Why should I clip my dog? Most dogs originally were bred in cooler countries such as Europe, England, Northern America, Alaska etc. These dogs were bred to live in cold climates that often got down to minus 10 degrees Celsius and these dogs lived outside in these temperatures. So coat type became important – the thicker the coat the more the air just above the skin was super heated and retained by the undercoat. Dogs and cats can only lose their heat from their body by panting or allowing the heat to pass through the skin into a cooler area (convection). If the animal was cold then body heat passed through the skin and warmed up the air under the coat to keep the animal warm (same reason we put on a jumper or coat in winter). The body temperature of a dog is between 38 to 39 degrees Celsius and the air temperature under the coat is usually around 32 degrees Celsius. In our warm climate (or hot climate) then this air above the skin never cools down. The body temperature keeps the air in long or thick coated dogs superheated all year round. The air temperature during our warm or hot months usually is 32 degrees or greater. So the dog literally is surrounded by a layer of air that does not get below 32 degrees and can get to 38 degrees at times. The dog is slowly “cooking itself” in hot air. Try putting a jumper on in summer and then walk around in our hot environment and feel how your skin feels – this is the way the dog is all day long. To assist the dog to get cool then it is necessary to clip the hair – this is why we recommend all thick or long coated dogs and cats get clipped in spring, summer and autumn. How do I tell when the nails need clipping? Normally a dog should have its nails just touching the ground when it walks. The nails are used for gripping the ground as it runs. If the nail is too long then the toes are going to be bent backwards. Usually the owner can hear the nails “clip” on the ground when the dog walks of lino or other hard surfaces. If you are not sure then bring the animal into our animal hospital and our nurses will assess the length of the nails. How short should I cut the nail if I am doing it myself? There is usually a “quick” that can be observed under the surface of the nail. This is the area of blood vessels and nerves. Do NOT cut into this area. As the nail extends down from that area then the nail is lifeless and can be cut without any discomfort. We recommend owners to bring the animal into our animal hospital and we cut the nails for the owner. The breeder says the long coat keeps the animal cool and I should not clip the coat. Is this true? NO – this is not true. It is a common myth that a heavy undercoat will keep the animal from overheating. But the reality is that the long or thick coat is to trap hot air next to the skin to stop the animal from getting too cold. This is important if you live in a country where the temperature can get down to minus 20 degrees. But in our climate the hot air makes the dog or cat get even hotter. A dog or cat can only lose its heat by either panting or by movement of heat from a hot area to a cold area. The animal’s temperature is usually around 38.5 degrees and the air next to the skin gets superheated and that means that the animal is usually bathed in a climate that is around 32 degrees all the time. This is not a comfortable temperature and this hot temperature damages the skin and the associated structures. Think about wearing a jumper (a thick jumper) in the middle of our summer and what that does to your body and your skin. Remember the animal cannot sweat and cool itself with evaporate cooling. This is what your animal is like all the time.